During the last several months, Nicaragua has been ravaged by political mobilizations and state repression. At least 300 people have been killed, thousands injured, and scores jailed by the government of Daniel Ortega. Protests to stop cuts to Nicaragua's social security system and environmental destruction caused by governmental projects have mushroomed into a broad popular movement that is challenging the authoritarianism of the Ortega movement. 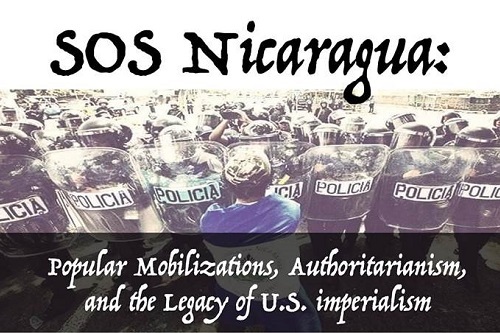 This talk examines the current political crisis within the context of the legacy of authoritarianism, U.S. policy, dictatorship, and revolution in Nicaragua. Dr. Ochoa teaches Central American and Mexican history, revolution, and social movements, critical food studies, and migration in the context of global capitalism and U.S. imperialism. Ochoa has published over a dozen books and journal issues. His most recent book is México Beyond 1968: Revolutionaries, Radicals, and State Repression during the Global Sixties.